Ronnie took the Rebs and Stew the Marauders. Here are some highlights. The opening scene with the Rebels on the left. The forces are within a model of the starter boxes IIRC. Ronnie has snuck his commander (who happens to have a sniper rifle) onto the top of the tower and into a commanding position that mirrors his Grogan with the heavy weapon on the right. This turns the battlefield into something of a shooting gallery. A few moves later, Ronnie is lining up a shot that Stew doesn’t seem to find very worrying. 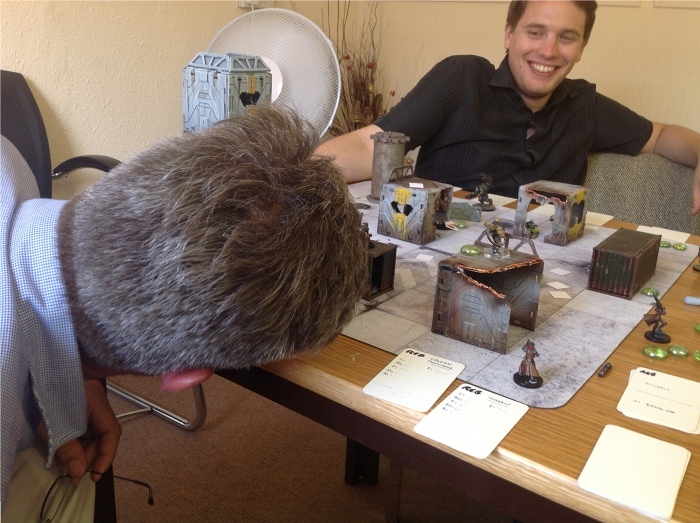 You can see Ronnie’s dead commander just to the right of the board. She didn’t get to do much sniping after all. 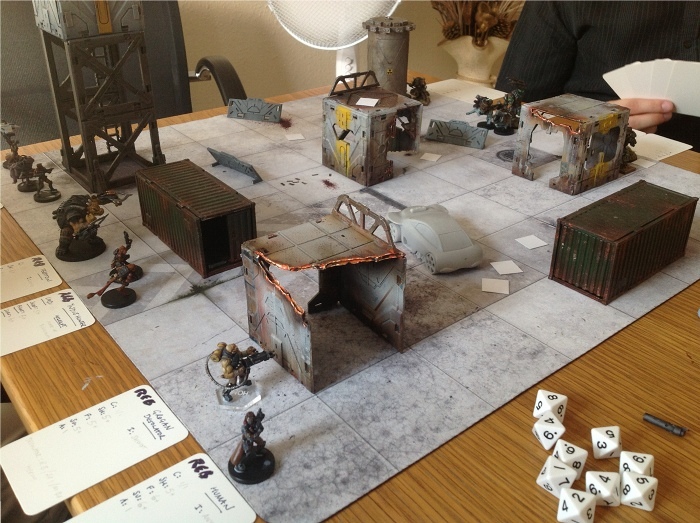 After an even start to the game the combination of interesting dice rolls and Ronnie’s tactical genius¹ meant that the Marauders began to run very low on models. 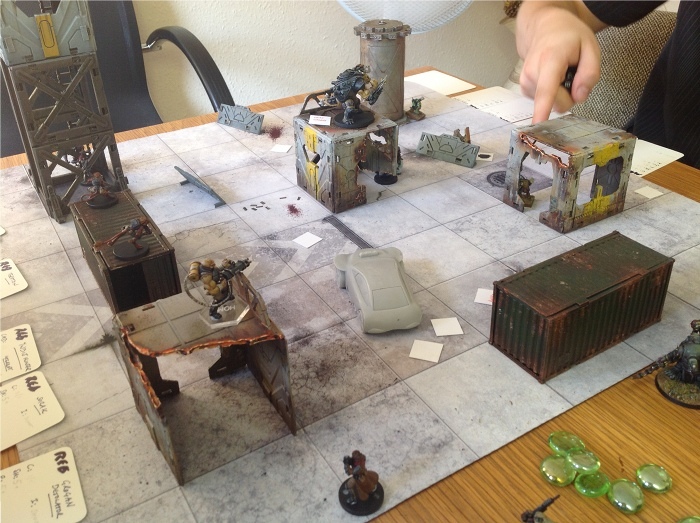 Here you can see Rebel Teraton charging at the remnants of the Marauder force: two Goblin snipers and their Commander. This was where the game ended with a convincing victory for the Rebs. 1: he made me say that. Ronnie made you say “tactical genius.” Hahahaha! That’s funny. This is a very exciting post. The game looks really cool. Stew, you let the marauders down. Secondly, Jake, what he obviously needed was the ability to play a booby trap card on himself. Interesting to see the board. Is this the standard level of terrain or are you imagining more? I was going to comment on that. Looks a bit thin on the ground, especially for a game with snipers involved. You are correct – the terrain was a little sparse, but it’s what we had to hand (although Ronnie and I are going to pick up some finished sprues from the factory on Monday!). There were a few more clear shots in this game than there should have been, so yes, shooting was rather lethal (at least for Ronnie it was – my snipers, who are better than his, did not hit once… the dice were broken I think…). 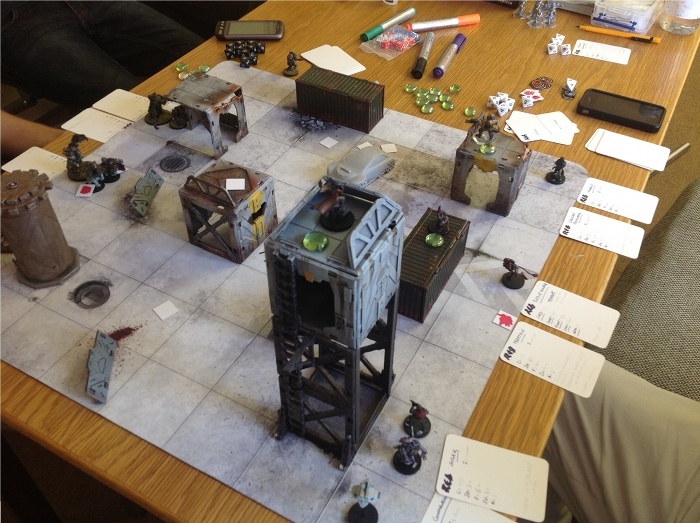 However, we did count everything up afterwards and realised we were probably only playing with the equivalent of two thirds of the game contents, and considerably fewer small barricade pieces, so all is looking good for the finished game :-). The other contributors to the several clear shots were Ronnie’s great keenness on looking for them and Stew’s lack of paranoia about them. I think he might have learned a bit more of that here. As even a small amount of obstruction stops a target being a clear shot you can often position a model so that something is covered. Of course, then you’re possibly compromising your own ability to get the shot you want, so it’s a balancing act. What was interesting was the lack of fighting in this game. All the killing was done at range. That makes sense for these sides though, as the majority of their troop types are not very good at melee. It’s another way that the different factions change the way the game works. cant wait to get to play this! Teraton model looks sweet painted! Can’t wait to try the rules for these 2 factions! Awesome pictures! Could you tell us what models will Marauders and Rebels get in beta rules? Just so that we can start thinking about proxy models already. All the stuff from the starter sets, at least. Basically I’m going to get as many of the models as I can done. Jake, this sounds fab. Thanks for doing this for us before the game is launched!